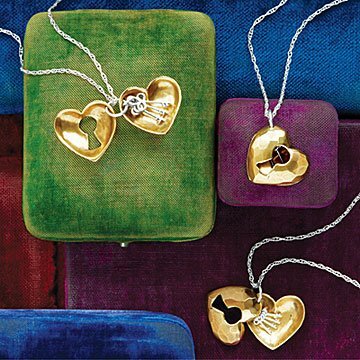 Britta Ambauen's heart-shaped locket holds sterling silver keys symbolizing each of your children. It's no secret that your kiddos hold the key to your heart. Now you can keep them extra close with this sweet locket. Customize the number of sterling silver keys inside (one to represent each of your so-loved little ones) and you'll add an instant touch of sentimentality to any outfit. Britta Ambauen handcrafts the detailed, faceted heart from bronze, and hangs it from a sturdy-yet-delicate sterling silver chain for some sweet style. Handmade in Washington.